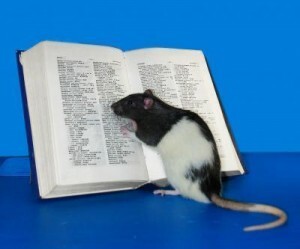 No, it wasn't smart enough to read, but genetically manipulated Hobbie-J was one smart rat. According to recently published results in PLoS One, researchers at the Medical College of Georgia (MCG) and East China Normal University have genetically engineered a rat to be significantly smarter than its peers. The rat was named Hobbie J, after the popular Chinese cartoon. Lest you think the world is determined to try to turn all children’s fiction into reality, let me assure you that that we are far from a Secret of NIMH type scenario. Hobbie J has better memory and improved learning skills but only moderately so. The real news is that scientists have a better understanding of how one gene (NR2B) affects the brains of mammals. Using this sort of information, researchers may one day find a means to reverse dementia or increase human intelligence. Your brain has a set of receptors known as NMDA which help with memory formation and learning. When you are younger, the NR2B gene helps control these receptors, but after puberty, the NR2A gene tends to take over. The difference between the two is slight: NR2B helps receptors stay active for just milliseconds longer, but that’s enough to have a noticeable effect. The switch between expressed genes is part of the reason why we seem to learn so quickly and easily in our youth, but have difficulty with new concepts as we age. Patients with Alzheimer’s disease, and some cases of dementia, have correspondingly disrupted levels in their NMDA receptors. Researchers hope that by studying the way that genes regulate the receptors in rats, they will be able to predict and effect similar changes in humans. This could lead to genetic engineering, or a chemical treatment, which may give someone ‘youthful learning’ throughout their entire life. How much smarter was Hobbie-J? Well, she was a Long Evans female rat, a group already known for their intelligence. Both Hobbie and similar control rats could remember the path to a chocolate reward after a 1 minute delay. After 3 minutes, only Hobbie could find the treat quickly. After 5 minutes, both rats seemed to forget the correct path. In more complex situations (such as a water maze) Hobbie again outperformed her peers, but in a similarly rationed way. Hobbie isn’t the first super smart rodent. 10 years ago, Dr. Joe Tsien (MCG) helped create Doogie, a genetically enhanced mouse. Like Hobbie, Doogie had his NR2B gene over expressed in the hippocampus, and showed marked improvements in memory and learning. Impressively, Doogie maintained his augmented skills as he aged. The mechanism for over-expressing the NR2B gene is through the production of CaMKII, a common protein that affects NMDA reception. Earlier work by Tsien published in the journal Neuron suggests that quantities of CaMKII can be manipulated to selectively erase memories in mice. While we’ve seen similar results in flies, mice have significantly more complex brains. Both experiments would indicate the importance of the NR2B pathway on mammalian memory. As reported by the MCG News, there is some hope that magnesium could serve as a functional pathway to memory improvement in humans. Magnesium blocks some NMDA receptors, and the brain could compensate by over expressing NR2B. But between super smart rats and super smart humans exists a range of other mammals that would need to be tested. With cats, dogs, monkeys, and chimps all possibly in the queue ahead of humans, there is likely to be years of testing before researchers will know if people could benefit from the methods used to improve Hobbie-J. Even if such a pathway exists, the only method to over express it may be through genetic engineering. If so, it will be added to a growing list of known but unexplored means by which humans could be ‘improved’ by altering their genes. I wonder how long that list will have to grow before it becomes seductive enough for someone to try it on their child.